"Swap meet" redirects here. For the CSI episode, see Swap Meet (CSI). For other uses, see Swap meet (disambiguation). 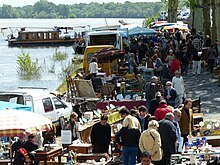 Montsoreau Flea Market, Loire valley, France. A very large and popular swap meet held in Beaudesert Queensland Australia run by the Beaudesert Motoring Enthusiasts Club inc.
A flea market (or swap meet) is a type of street market which provides space for vendors to sell previously-owned merchandise. This type of market is often seasonal, however in recent years there has been the development of 'formal' and 'casual' markets which divides a fixed-style market (formal) with long-term leases and a seasonal-style market with short-term leases. Consistently, there tends to be an emphasis on sustainable consumption whereby items such as used goods, collectibles, antiques and vintage clothing can be purchased. Flea market vending is distinguished from street vending in that the market itself, and not any other public attraction, brings in buyers. There is a variety of vendors; some part-time who consider their work at flea markets a form of hobby due to their possession of an alternative job, full-time vendors who dedicate all their time to their stalls and collection of merchandise and rely solely from the profits made at the market. Vendors require skill in following retro and vintage trends as well as selecting merchandise which connects with the culture and identity of their customers. Different English-speaking countries use various names for flea markets. In Australian English, they are also called 'trash and treasure markets'. In Philippine English, the word is tianggê from the word tianguis via Mexican Spanish (despite common misconception, it is not derived from Hokkien), supplanting the indigenous term talipapâ. In India, it is known as gurjari or shrukawadi bazaar or even as juna bazaar (in Pune).[where?] In the United Kingdom, they are known as "car boot sales" if the event takes place in a field or car park, as the vendors will sell goods from the 'boot' (called "trunk" in American English) of their car. If the event is held indoors, such as a school or church hall, then it is usually known as either a "jumble sale", or a "bring and buy sale". In Quebec and France, they are often called Marché aux puces, while in French-speaking areas of Belgium, the name Brocante or vide-grenier is normally used. In German there are many words in use but the most common word is "Flohmarkt", meaning literally "flea market". In the predominantly Cuban/Hispanic areas of South Florida, they are called [el] pulgero ("[the] flea store") from pulga, the Spanish word for fleas. In the Southern part of Andalusia, due to the influence of Gibraltar English, they are known as "piojito", which means "little louse". In Chile they can be called persas or mercados persa ("persian market") and ferias libres, if mostly selling fruit and vegetables. While the concept existed in places such as what are now India, Bangladesh, and China for millennia, the origins of the term "flea market" are disputed. According to one theory, the Fly Market in 18th-century New York City began the association. The Dutch word vlaie (also spelled vlie, meaning "swamp" or "valley") was located at Maiden Lane near the East River in Manhattan. The land on which the market took place was originally a salt marsh with a brook, and by the early 1800s the "Fly Market" was the city's principal market. A second theory maintains that "flea market" is a common English calque from the French "marché aux puces" which literally translates to "market of the fleas", labelled as such because the items sold were previously owned and worn, supposedly containing fleas. The first reference to this term appeared in two conflicting stories about a location in Paris in the 1860s which was known as the "marché aux puces". The traditional and most-publicized story is in the article "What Is a Flea Market?" by Albert LaFarge in the 1998 winter edition of Today's Flea Market magazine: "There is a general agreement that the term 'Flea Market' is a literal translation of the French marché aux puces, an outdoor bazaar in Paris, France, named after those pesky little parasites of the order Siphonaptera (or "wingless bloodsucker") that infested the upholstery of old furniture brought out for sale." In the time of the Emperor Napoleon III, the imperial architect Haussmann made plans for the broad, straight boulevards with rows of square houses in the center of Paris, along which army divisions could march with much pompous noise. The plans forced many dealers in second-hand goods to flee their old dwellings; the alleys and slums were demolished. These dislodged merchants were, however, allowed to continue selling their wares undisturbed right in the north of Paris, just outside the former fort, in front of the gate Porte de Clignancourt. The first stalls were erected in about 1860. The gathering together of all these exiles from the slums of Paris was soon given the name "marché aux puces", meaning "flea market", later translation. ^ "Beaudesert Motoring Enthusiasts Club". Beaudesert Motoring Enthusiasts Club. Retrieved 2017-07-26. ^ "Beaudesert Swap Meet & Static Vehicle Display". Beaudesert Swap Meet & Static Vehicle Display. Retrieved 2017-07-26. ^ "flea market | Definition of flea market in English by Oxford Dictionaries". Oxford Dictionaries | English. Retrieved 2019-03-24. ^ a b L., D. (2006). "Editorial Perspectives: Flea Markets". Science & Society. 70 (3): 301–307. ISSN 0036-8237. ^ a b Appelgren, Staffan (2015). "Introduction: Circulating Stuff through Second-hand, Vintage and Retro Markets" (PDF). Culture Unbound. Volume 7: 11. 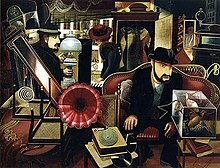 ^ Hernández, Paloma Albalá (2007). Americanismos en las Indias del Poniente: Voces de origen indígena Americano en las lenguas del Pacífico. Lingüística Iberoamericana. IX. Vervuert. p. 171. ISBN 9788495107527. ^ "Tagalong Lang". Tagaloglang.com. Retrieved 2013-02-09. ^ "History Blog Insight into History – A Weekly Instrospective Into The Past". Archived from the original on 21 March 2012. ^ "Flea Markets in Arkansas". Arkansas Arts and Crafts. Arkansas Department of Parks & Tourism. 2006. Retrieved 2008-10-11. ^ "What is the origin of the term 'flea ... | Oxford Dictionaries". Oxford Dictionaries | English. Retrieved 2019-03-24. Wikimedia Commons has media related to Flea markets.